School teachers in the Denver district of Colorado State, USA, have announced a strike from February 11, Monday, demanding fair wages and a change in the current compensation system for teachers. The call for the strike was given by the Denver Classroom Teachers Association (DCTA). Peoples Dispatch received press statements from DCTA President Henry Roman and spoke to Mike Wetzel from the Colorado Education Association (CEA) regarding the problems faced by the teachers in Denver. 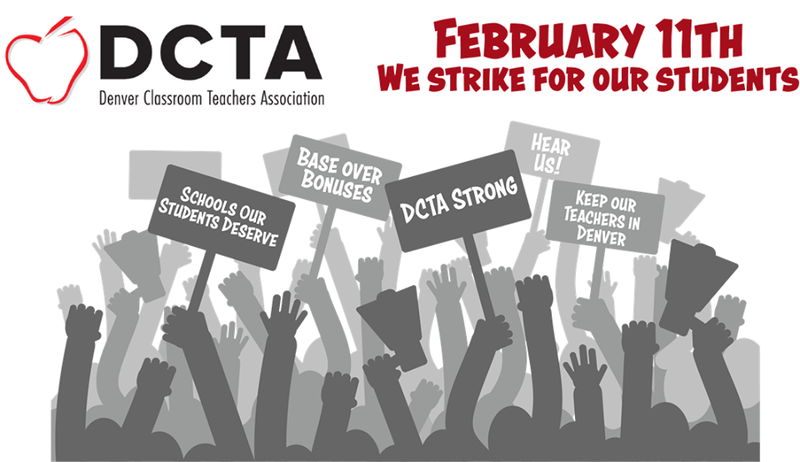 DCTA is a local association of the CEA, the statewide union of educators in Colorado, which is affiliated to the National Education Association (NEA). Peoples Dispatch (PD): What are the major demands raised by the Denver Classroom Teachers Association (DCTA)? DCTA: DCTA has been negotiating with the district for more than a year to improve compensation and address Denver’s teacher turnover crisis. Teachers are dissatisfied while working under a salary system that restricts base pay in favor of awarding one-time incentives and bonuses that most district employees find very unreliable and unpredictable. Denver teachers desire a salary structure with predictable and reliable base pay, like almost every other school district offers in Colorado. But Denver Public School (DPS) authorities did not respond to the teachers’ proposal to fundamentally change the current system of bonuses and incentives that insults teachers who are already giving maximum effort for their students. DPS needs to increase base pay for every teacher and special service providers. Retention needs to improve dramatically all over the district, not just in schools the district deems ‘hard to fill’. If DPS doesn’t start paying a professional living wage in this very high-cost city to every employee, we will reach a point where every school is hard to fill. PD: What are the teachers’ major objections to the current compensation system? DCTA: According to the ProComp system, which is currently in place, compensations are disbursed to the teachers and special service providers based on their performance. On November 2005, Denver voters approved funding to ProComp and it was fully implemented by January 2006. In 2013, the ProComp agreement expired but the district asked the teachers to postpone negotiations in order to perform a study of ProComp that would inform the negotiations. The teachers agreed and in between 2013 and 2017, several studies were done on ProComp while minor changes are discussed. At least two independent studies of ProComp were conducted. DPS also conducted its own internal study. These studies included surveys, focus groups, visioning sessions and data analysis. Each study essentially came to the same conclusion: teachers would prefer to have more base pay over incentives regardless of whether or not they worked in a high-needs school. At the same time, multiple external evaluations of ProComp determined that the district did not track the necessary data to attribute any educational impact to ProComp. PD: What is the response from the Denver Public School (DPS) authorities regarding your demands and the call given for the strike? DCTA: After 93% of DCTA members voted Jan. 22 to approve a strike, DPS authorities officially requested intervention from the State, which could have ultimately delayed our right to strike by up to 180 days. Until the Colorado Department of Labor and Employment decided whether or not they would intervene, we were not able to strike. This means that DCTA bargaining unit members reported to work until a decision was reached. We were disappointed in the District’s decision to ask for state intervention to delay our strike rather than negotiating in good faith with the educators in Denver. We know the District has the resources to reach an agreement, and we hope to return to the table to continue negotiations on a fair compensation system for all teachers and special service providers. The State announced on Feb. 6 that it wouldn’t interfere in the negotiations and Denver teachers welcomed the decision. DCTA is gearing up for starting the strike action from February 11, Monday. PD: Over the past year, there has been a wave of teachers’ strikes in the US, including the “Red4Ed” movement. The movement has now reached Denver. What do you feel about this trajectory of teachers’ organization and mobilization across the country? Mike Wetzel: The RedForEd movement reached Colorado far before this current call for a strike. We followed soon after West Virginia and Oklahoma last April. More than 17,000 educators, including many DCTA members, protested at our State Capitol over three days against the weak State funding for public education. Despite having one of the best state economies in the nation, Colorado’s per-pupil funding is $2,800 below the national average. Our State has withheld about $7.5 billion over the last 10 years from public schools that is required by our State constitution. After our April “Days of Action”, our teachers in Pueblo went on strike for six days in May and won an agreement for improved pay. So the RedForEd movement was strong throughout Colorado all through 2018 and Denver is now the focus.